Exactly in what way can playing with jigsaw puzzles benefit your senior loved one? For one, this study tells us that jigsaw puzzles are able to make use of different parts of the brain, thus, potentially reducing the effects of aging on a person’s brain. By aging effects to the brain, this can include memory problems, among others. Being a home care company in La Mesa, California, we help you see to it that the conditions and welfare of your loved one are well-monitored, especially in their aging years. So, we would like to impart this valuable information as to how you can make their time not just productive but also beneficial to their health. Jigsaw puzzles can be played with others which can open up new opportunities for friendships and good conversations. When they’re with other people, a senior person can feel accepted and less isolated, thus, paving the way for their good mental health. Knowing that isolation is a key trigger for elderly depression, making new friends over a game of jigsaw puzzle is indeed a wonderful and health-wise idea! Aside from friends, our home health aides can also enjoy this mind-enhancing game with your loved one. According to this study, playing with jigsaw puzzles can greatly enrich the cognitive functioning of a person’s brain as it allows the person to use visuospatial capacity. As your loved one gets to analyze which part of the puzzle needs to be fit, their brain neurons can also actively work at bridging with each other so that the brain’s power capacity is even more built up. Since jigsaw puzzles can also be played alone, your aging loved one can also make use of their alone time to relax. Playing with jigsaw puzzles requires a sense of focus and repetition that is similar to what is achieved in meditation, thus, opening an opportunity for the player to relax. As they choose to play it by themselves, they can exercise calmness and presence of mind as they strive to complete the whole game. With healthy mind comes healthier bodies. As a Home Care Agency in California, we recognize that nurturing the right mindset in our clients can help them to eat well, take their medications on time, and even groom themselves properly. 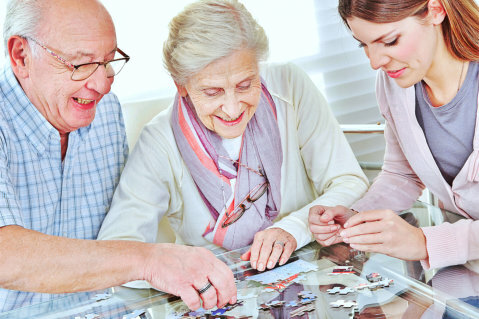 Completing a jigsaw puzzle or playing it with their significant relationships can help your loved one achieve the feel-good moment, consequently giving them a good perspective towards their physical health. To continue promoting ways to care for your aging loved one at home, you can also tap our assistance at Sunshine Home Health Aide Org., Inc. Our highly qualified team can partner with you in ensuring that as your loved one spends their aging years, their wellness and health will be supervised.